1888 Whitechapel District, London. 00:25am. As usual too much fog surrounds the British Kingdom. Then a shout… As another victim falls prey to the notorious Jack the Ripper, as he has been dubbed. Finally, not being able to endure this any longer 8 investigators come together to try and uncover the mystery of Mr. Jack. The question is: Can they uncover him before he strikes again, even when one amongst them really is the Assassin? 2 players with 8 characters. One of them runs a race against time, to uncover the truth of who the Ripper really is. While the other works to escape and deceive everyone from the fact that he is the shadow in the night that strangles these far from innocent women. With only one accusation throughout the whole game players need to pay close attention to who is in the shadows and who remains in the light. Mr. Jack is a game published and edited by Hurrican Games and distributed solely in the USA by Asmodee editions. And that’s what this game is all about. Eliminate every false trail until you find the truth or in this case: Jack the Ripper. I love the quality of the components. The “cards” are not made in this thin playing cards style. Instead they used this really thick cardboard for them. Great! The figures for the different characters are just small discs with stickers on them. But they are made of wood and I’m the guy who likes wood more than this plastic stuff. Mr. Jack is a two player game. No more, no less. One player takes the role of Mr. Jack and the other the role of the Inspector. Jack draws a random character card and this is his character on the board. Yes, this means even the great Sherlock Holmes can be Jack the Ripper. The Game consists of 8 turns in which the Inspector has to catch Mr. Jack. If Jack escapes from the city or does not get caught until end of turn 8, he wins. Each round 4 of the 8 character cards get laid down in front of both players. Then (in a different sequence each turn) the players can choose characters from these laid out ones and move them around (and use their special abilities). After all 4 characters have been moved the inspector asks Jack if he is seen (or witnessed as it is called in the game). Being witnessed means his character is next to another character or is standing in the blaze of a gaslight. Jack answers with yes or no and the Inspector then can rule out some of the suspects on the board. For now after a few plays I think the replay value is quite high. The game is really fast (15-30 minutes) and it’s getting better as the players (especially the Mr. Jack Player) get more experienced. So. What can I say. I really like this game. I love Sherlock Holmes, I love games of deduction (even this is an easier one when it comes to deduction games). I think this will find it’s way on the gaming table more often than other games in the next time. 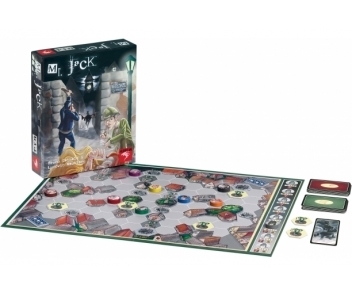 Mr. Jack is a two player deduction game in which one player is Jack the Ripper disguised as one of the 8 characters on the board, and the other player must try to deduce which of the 8 characters is Jack. The game clocks in at 20-45 minutes. On each turn, the players draw 4 character cards, and each control two of them. All of the 8 characters have special abilities ranging from drawing an Alibi card (which proves a characters innocence), to moving additional characters around. At the end of the turn, if Mr. Jack is near a light (or otherwise illuminated), all of the characters that are not illuminated are flipped over to their “innocent” side, and if Mr. Jack is in the dark, all characters illuminated are innocent. This continues until either Jack is caught, escapes, or lasts 8 turns. Through the game, 4 of the 6 lamp posts will be turned off, making it easier for Jack to evade. This game plays so quick that you can easily fit two games in; one where you play Mr. Jack, and one where your co-player plays Jack. The two sides play different, and are fresh enough to make you want to continue playing. Mr. Jack is a light game, so don’t come into this expecting a deeply strategic brain burner. Half the fun of the game is taking a risk and accusing someone, even when you don’t have it entirely pinned down. If you’re a fan of light games made for two players, you will probably enjoy this. If you don’t like having to deduce information out of limited clues, you may want to give this a pass. Alright, the game is light on story. So is checkers. What this game provides is an easy to learn, hard to master two player game that should fill 30 – 45 minutes of your day. I see a lot of people alluding to the deduction part of this game, which is accurate, but I find it has some chess-like qualities as well. There are 8 different characters, or pieces if you will, each of which possesses a different ability. One player will take the role of Jack the Ripper, posing as one of the investigators in an effort to escape. The other is the detective attempting to catch him. Jack has two ways to win. He can either escape the district while unseen, or he can elude capture until the end of the 8th turn. The detective, on the other hand, must capture Jack to win. The board is set up the same way each game. Jack picks a card to determine who they are impersonating, and then four of the eight investigator cards are chosen. The detective chooses one to move and uses their ability, Jack chooses two to play, and then the detective the fourth. The following turn the remaining four will be played in the opposite, Jack plays one, detective plays two, the the detective last. Each character has a special ability that in all but two cases are mandatory to use. These include swapping which manhole covers are open and closed for sewer access (quick travel) which exits are open or closed by police cordons and what gaslights are lit and which are not. Jack’s goal essentially is to cause as many of the investigators either seen or unseen at the end of the turn as possible, depending upon how he wants to play. If he wants to escape, he needs to be unseen, and if he wants to play to the end of the 8th turn, he can do it either way. Investigators are seen if they are standing next to a lit gaslight, adjacent to another investigator or illuminated by Watson’s lantern. Jack must reveal at the end of the turn whether he is seen or unseen, and the detective then gets to turn over the investigator tokens that are eliminated by this information. In addition to this, whomever plays Sherlock Holmes picks an alibi card secretly. This stack consists of all but the card Jack is holding, so the detective can tell by this card one character who is innocent. Jack, on the other hand, can use this ability to remove one of those cards so the detective will never be able to eliminate one investigator in this manner. Figuring out who Jack is isn’t enough, however. The detective player still needs to catch him with one of the characters by landing on the same hex. If the detective accuses the wrong character, he loses. I like that the game comes in at under an hour. I also enjoy that there is very little random aspect to the game. While you don’t know which cards will be available on turns 1,3,5 & 7 until they are drawn, I still find that when I loose there was always something else I could have done with the characters available to me to have had a better outcome. When things don’t (or do) go your way, you generally cannot blame the game. You have no one to blame but yourself. This game doesn’t get old for me. I will happily set the board back up after playing a round and play another. I hope this review can help you determine if you feel the same. In the wake of weekend after weekend of two-player cooperative games and countless rounds of Council of Verona, the lady and I were looking for something competitive to play against each other. I texted my buddy Matt of Prettiest Princess Games and he threw a few recommendations for me to look up online, including Mr. Jack. At first Mr. Jack seemed like it wouldn’t quite be my bag, but lots of people were raving — so I bought it. We sat down on a Friday evening, after she eagerly punched out all the cardboard tokens and cards and placed stickers on the wooden tokens that represent the game’s characters. I read through the instructions twice, and to be honest they win no awards for clarity. Maybe it’s just the English translation. I decided to set up the board and learn the rules the old-fashioned way: by playing a round. Walking through step by step and not focusing on who was winning and how, we pieced together gameplay and strategy through trial and error. By our third game we no longer needed the instructions, except for setup (Gawd help us if we ever lose them — see Setup Time below). There’s not a ton of pieces. But each piece–from characters and gas lamps to police cordons and sewer covers–are placed very specifically on the board, with certain lamps numbered to go into a certain space. I don’t believe I’ll ever be able to do this from memory. Despite that, it takes less than a minute to drop a total of 18 pieces into their starting spots, then the “Mr. Jack” player picks a random card to determine his character. Game on! We scratched our heads a lot when trying to figure out how to start, but quickly picked up the rules in play via trial and error. Each character has his own ability to be used before, after, or instead of his movement — it took us three games to memorize these abilities and how they work, recognizing them by character name or an icon on the character’s card. We’ve pulled this game off the shelf on five different nights in three weeks, generally playing twice (once each as Mr. Jack and the Investigator) before moving on to another board game. I suspect that we’ll buy the expansion when it starts to get stale — which I can see happening pretty quickly, with the same starting layout and character abilities each time, altered only by luck of the draw order during play. Overall it’s a fun, relatively quick game that a novice gamer can pick up and enjoy without hours of learning a laundry list of rules and strategic minutia. Give it a try if you’re looking for a game to play on lazy evenings with your significant other. Mr. Jack is a simple 2-player deduction game where Jack the Ripper has gone undercover as one of 8 characters. The game lasts a maximum of 8 rounds, after which, Jack wins the game. After each round, Jack will tell the other player if Jack is “in the light” or “in the dark”. Jack is in the light by being adjacent to another character or a lamp post, or by being in the line of sight of Watson’s lamp. Each round, each player moves 2 characters, for 4 characters per round, and using all 8 characters every 2 rounds. There is some alternating between each other when you choose which character(s) to move, and each has their own abilities. So there is a lot of difficulty in deciding which character to move for the most added benefit, or which character to move to prevent your opponent from taking that character. At any point during the game, the good player can move a character onto a suspect’s location and accuse that player of being Jack. The game ends immediately and if the accuser is correct, he wins. Otherwise, Jack wins. Also, if Jack was in the dark the previous end of round, then he is able to escape from the city if he is close enough to an exit. The components in this game are very sturdy, very well designed and colorful, and altogether is a great quality game with excellent components. The board is very easy to look at and recognize everything that is on the board for what it is. There is decent replay value for this for a while, but after both players become really good, the final accusation at the end of the game is more of a guess as to who the other player is. But it will take a lot of plays and work to reach this point. Some things that will change on the board is lamp-posts will move and also go out entirely (puts characters in the light), manholes will move (block passageways), police barriers will move (blocks escape routes for Jack), and of course, the characters will constantly move around. Mr Jack will always have a special place in my heart because it’s the game that made me rediscover board games. There is a time, when you are in a couple, that you don’t know what to do after S** on a rainy day. Let’s play game….You open the game closet and take all the dusty board games boxes that you have and played when you were younger…Monopoly, Pay Day, Destin, Yathzee, Mastermind, Othello, Clue….And then you realize that these games are now fun anymore and there are not like you… they didn’t get better with time. It’s a 2 player game only in which 1 takes the role of an inspector and the other one takes the role of the Jack the Villain. It’s an asymmetrical game where the goal of the inspector is to find and arrest Jack and where Jack’s goal is to get out of the city or not get caught until the end of the last round. The rule book is well made, the rules are simple and clear to understand. Each round condition are printed on the board. At the beginning of the game there are 4 characters “visible” and 4 characters “not visible” that are all supspects. Each round players move 4 selected characters (2 each player) that have all special abilities in order to bring the character “visible” or “not visible” to other characters. The inspector changes the character status (suspect to innocent) according to the visibility rules. The game its self is really simple to understand and to play. It’s light on strategy and deduction. Despite this, Jack’s role is a bit harder and should be played by the most experienced player. After 10 years I still enjoy playing this game. I just introduce it to my 11 daughter and she loved it If you like simple game that are quick to play, easy to learn and light on strategy and deduction Mr Jack might be the game for you. I heard about this and thought it sounded like fun, and then I played it and found that it was exactly what I was looking for. In the game one player is Jack the Ripper and has just committed a murder, the other player is a Detective trying to uncover Jack’s identity. Jack has disguised himself as one of the 8 Investigators on the board,at the beginning of the game Jack gets one Alibi card which identifies which of the Investigators he is disguised as. The Character discs are placed on the board in a predetermined layout(in the original game, with the expansion Jack and the Detective take turns placing the pieces) and then 4 Character Cards are played to determine which Investigators are active this turn. Players take turns choosing characters, but the order of selection changes every round. In the Odd numbered round it goes Detective, Jack, Jack, Detective and in the Even numbered rounds it’s Jack, Detective, Detective, Jack. You get either first choice or two turns in a row so each have their advantages. As the game progresses Jack has to reveal whether or not he’s in shadow, and if he is then on his next turn he can attempt to escape the board. If he successfully makes it off the board Jack wins. If he can evade detection for 8 rounds, Jack wins. If he can make the Detective think that someone else is Jack, Jack wins. The only way for the Detective to win is to successfully find Jack. I love deduction games and I love any game that is both two players AND deduction. Games like Mastermind and Hangman have always been favorites of mine. This makes those pale in comparison. The game pieces are fantastic quality with nice wooden pieces that you apply stickers to for the characters on the board. It’s simple but it works. The “Cards” in this game are thick planks of cardboard that remind me of tokens in other games except for the fact that they’re rather huge. The symbols on the cards make a lot of sense once you’re familiar with them, though I think those are the toughest part of the game, teaching new players what they mean. It can be a little intimidating to learn that many symbols at once, but it’s easily done. And even though I love this game I stink at it. I think I’ve made it off the board once and I usually end up with all but one token being found Innocent by the end of the second turn. But be that as it may I love this game and it provides exactly what I’m looking for in a two player deduction game. And I personally find this to be one of the more exciting games I own, the “Cat and Mouse” feeling of chasing or being chased come off extremely well, even in a game that plays so quickly. Mr. Jack is a very simple yet very complex game, its depth of strategy is very good. One player is “Mr. Jack” (a.k.a. Jack the Ripper) and the other is the investigators, attempting to prevent him from escaping and reveal him before morning. The game is played over 8 turns, at the start of each turn four character cards are flipped; these are the two player options for which characters they are allowed to use that turn. The players each will get two character picks from the available cards in the order: A=>B=>B=>A with the players swapping who gets first choice. After a player chooses one of the available character cards then moves and uses the action of the character on the card. After all 4 of the cards are chosen, Jack must reveal whether he is in the light or the dark. This lets the investigator narrow down the suspects by seeing who is not in whatever Jack specified. Overall, I found the game play extremely in depth. The Strategy is, while easy to grasp after several games, complex enough that it will by no means mastered quickly. This game has beautiful components, all of the pieces are nice wooden markers. The artwork is perfect, it really captures the atmosphere of the game very well. The cards are, as the rest of the components, quality; they are large and heavy cardboard, very satisfying to wield. With the price in the 30-40$ range, this game is well worth the cost. Overall I found Mr. Jack very engaging, very strategic and with a very high replay value. I would highly recommend it to anyone who is interested. Mr. Jack just broke into my top three 2-player games of all time. Yes, it was that good. While the price is up there for a 2-player game ($43 MSRP but cheaper at some stores), it is well worth it. The game is very high-quality in every way (more to come), but as good as the quality is, the gameplay and strategy steal the show. Play as Mr. Jack or the Detective. Move in and out of light and darkness according to whichever is most advantageous at the moment. Take special care to utilize the character skills wisely or you may get burned (as I have many times!) by your opponent. The artwork immediately caught my eye. The board is incredibly detailed with a fun, cartoonish, yet realistic feel. The character and alibi “cards” can barely be called cards because of how thick and sturdy they are. The characters aren’t just faceless tokens, there is character depth and storyline (bolstered by great background descriptions of each). The map itself is perfect to facilitate a balance of strategy and player advantage (with strength spots and weakness spots for each character which must be accounted for on both sides). The gameplay is very simple in construct, but there are innumerable tactical plans which may change at a moment’s notice. The entire game revolves around the witness card. If Jack is “seen” (i.e., in the light), the witness card must indicate as such which then eliminates the chance that Jack is one of the “unseen” characters, and vice versa. These characters are then tagged as innocent. This goes until either Jack escapes the city, remains hidden through the eighth round, or until the Detective makes an accurate accusation. Sound simple? Not so fast. With each player “playing” the part of two of four randomly selected characters each round, a strategy of illuminating as many characters as you can that round may be quickly thwarted by your opponents moves. Then you add the character abilities on top of that. For example, John Smith moves a streetlight (and thus the illumination it provides). Sir William Gull can switch spots with another player (got me several times last game!). Or Sherlock Holmes can eliminate an option by drawing an alibi card. I won’t even get into the manholes, police cordons, or the failing streetlights. You’ve got to experience it for yourself! Overall, this is one of the best 2-player games out there. It’s quick (20-30 minutes), there’s some luck but mostly strategy, replay value is very high, and it’s a blast! I highly recommend this one and give it a solid 8.5. I don’t really get into deduction games. Many of them require a good memory, and that isn’t one of my strong points. One player plays Jack the Ripper who is randomly selected at the beginning of the game and the other player plays the authorities trying to catch him in 8 turns. The turn sequence is cool, every other turn favors a player allowing him to choose the first and the last of 4 characters to move and activate their special power. The other player chooses second and third which characters they will use. Mr. Jack wins if he/she escapes before the last turn OR stays unaccused when the game is over. The other player wins if Mr. Jack is properly accused. There are clever mechanics for the deduction portion of the turn. a character is seen if adjacent to another character or a street lamp is shining on him. The street lights turn off slowly as the game progresses. The only complaint is that in every game that I have played, the choices are 50/50 on the last turn, and a lucky guess wins the game. Only one accusation can be made in the whole game. Mr. Jack, from Hurrican Games (2006,) is a quick two player game of skill, deduction, and a bit of luck. Given the game’s notorious titular character, Mr. Jack is surprisingly light hearted and tame. The suggested age of nine and up seems about right, and games last 20-30 minutes. The components are quite nice, and the illustrated instruction book is clearly written. Setup of Mr. Jack involves unfolding the board and placing eight hex shaped “lamppost” and “manhole cover” tiles on set spots on the board. Eight colorful wooden character discs are placed on their specific starting places. Finally, a clock token is set in the start position, and two cardstock “barricades” are placed at two of the four possible escape routes where Mr. Jack might flee. If Jack manages to leave the city before being caught, he wins the game. Players then choose whether to play as Jack or the investigator. The turn order system is well designed. The first player makes one move, and the other player makes two consecutive moves. Then the first makes the last move of the round. So the pattern of the first round is 1-2-2-1. The order reverses after each round, so round two would play 2-1-1-2. The clock token advances after each turn, and one of the lights is removed after each of the first four turns. If Jack’s is not named by the investigator by the end of the eighth turn, Jack wins. But if the investigator correctly identifies Jack, then the investigator is victorious. The primary method of ruling out guilty vs. innocent suspect characters is the character tokens’ proximity to light (lamppost tiles and a lantern). Immediately after the players make their moves, the investigator asks if Jack is visible. The player playing Jack uses a two sided card to indicate whether Jack is next to a lamppost or in the path of the lantern. If Jack is “visible”, the two sided card is flipped to the side depicting a lighted Jack. Otherwise, the card is turned to indicate Jack hidden in the darkness. Based on the jack player’s report of Jack being lighted or in darkness, the investigator can rule out all characters in (or out) of the light. There are also “Alibi” cards collected after a certain character action. These cards each rule out one of the seven innocent characters. One strategy for the person playing the investigator is to move the unknown characters in and out of lighted areas. Each of the eight characters has specific movements and actions, and players can use them to gain advantage over or block their opponent. Although the mechanics of Mr. Jack are quite simple, the game can become an exercise in tactics. 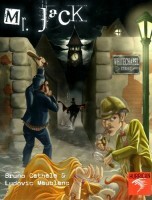 Some reviews have cited that the game is a bit unbalanced, as it favors slightly the investigator. I have not yet noticed an disparity in the two roles, but repeated plays may prove otherwise. With the quick play time of Mr. Jack, we normally play two or more games per sitting. We alternate playing Jack and the investigator, which would offset any inequity in the roles. Mr. Jack is a good game with quality components and clever mode of play. The character and alibi cards are some of the thickest and sturdiest I have ever seen. The only minor quibble I have is with the artwork of the board itself. The streets and thoroughfares are a drab gray color that makes other features like manholes and structures more difficult to distinguish. Mr. Jack is fun and challenging, and it is distinctive enough to justify its place in my collection. Mr. Jack is one of those games, which are easily learned but hard to master. The rules are not complex, every turn(out of 8) you have to move 2 out of the 4 available characters for the turn. Additionally all characters have a special ability, you can/must use. After both players (Mr. Jack/Inspector) have moved their characters for the turn, all characters either have witnesses or not. You have witnesses when you are adjacent to a lamp post or to another character, otherwise you are without witnesses. As the Mr. Jack player you have to declare if Mr. Jack has witnesses or not. Thereby the Inspector player can deduct who remains as a viable suspect. The goal of the inspector is to whittle the list of possible suspects down to one, the goal of Mr. Jack to either escape the game board or remain undetected through the 8 turns. The inspector will initially have an easier time, but if up against an experienced Mr. Jack this might not be the case. Mr. Jack has to rank up there as one of the great “filler” games. Not the greatest components, artwork nor oozing with theme but it’s so easy to learn, easily portable and to quote another review “for your gf to like”. My gf loves this game! This game has become a great filler game between heavier games on game night and the right choice to pull out when traveling. With ease of set-up and the number of games you can churn out in a couple of hours this is a definite “go to” game when your in the mood for something light. Even though it’s only a 2 player, all spectators get right into it and get involved guessing who is Jack. It also amazed me how many different strategies different people will bring when playing which ultimately changes the experience. My wish for Mr. Jack would have been a grittier art style and maybe some miniatures but for mass appeal and price point it passes. Not too much depth just simple deduction but fun and quick. On the bright side, the game is quick and easy. The expansion offers some additional characters and an option for players to select their 8 characters (4 for each player), which makes the game a little more balanced. If you like a light, quick, easy, deduction game you should have a look into ‘Mr.Jack in New York’, which is said to have sorted out the balance issues (haven’t played it myself, tbh). I enjoyed this game. I bought it having never played it and was pleasantly surprised. The rules were simplistic enough that it was easy to learn and master the mechanics, but the strategy was complicated enough that it kept you engaged and thinking the whole time. It was a good buy, and it is an overall enjoyable game. Mr. Jack has recently become one of my Girlfriends favorite games largely due (in my opinion) to it’s ease of play, quick game time, and deductive elements. There are far worse ways to spend an evening than sitting down with your significant other, and doggedly hunting her/him through the streets of White Chapel. This is a quick playing game for 2 where one side plays “Jack” and the other is trying to discover his/her identity and make an arrest. Simple and pretty, it can be played in about 20 minutes. Plenty of strategy involved. Great game to fill 30 minutes. The only one I can play with my wife. Add a Review for "Mr. Jack"